.. data on total housing units are important to the housing industry and many others .. to understand the characteristics, patterns and trends of the housing market, we need good data on the number of housing units. Understanding the how, where, when, how much housing market change might affect you … starts with the number of total housing units by geographic area. As of Census 2010, there were 131,704,730 housing units in the U.S. As of mid-2014, the total number of housing units had increased to 133,957,180 (2.25 million units, a 1.71% increase). See more detail in the related Web section. 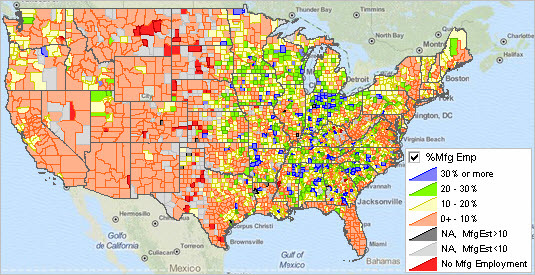 Patterns of housing unit percent change by county, 2010-2014, are shown in the map below. More than 1,000 counties (1,214 counties of 3,142) experienced a loss of housing units between 7/2010 and 7/2014 (orange and red fill patterns). Six counties lost more than 1,000 housing units during this period. Click graphic for larger view with details. – data based partly on Census 2010 &s Census Bureau housing unit estimates. Realtors, brokers and selling agents need to know how total housing units are trending — what has been changing where that might affect sales now and in the months ahead. The construction industry and builders need data on the number of housing units and data on the rental vacancy rate to assess likely demand by type of housing in the future. Businesses employing people who might tend to occupy rental properties need to know about the availability and affordability of nearby residential properties. Every school district needs to know how many students there will be enrolled; examining housing unit trends is imperative. By understanding that growth in the housing market may mean new jobs, and more, economic developers, planners and city/neighborhood stakeholders need to monitor what housing unit change in their area means to them. Lenders and financial institutions need these data to assess viability of loans to businesses planning to develop new housing units and assess value in making loans to potential housing buyers. Understanding the housing stock size, trends and composition in an area, and how that differs from adjacent areas, can help determine the targeted planning for stabilizing and improving local housing markets, developing and preserving affordable rental housing and facilitating neighborhood investment. A housing unit is a house, apartment, mobile home, group of rooms or single room, which are occupied or intended as separate living quarters. The separate living quarters that define a housing unit are those where the occupants live and eat separately from other residents in the structure or building, and have direct access from the building’s exterior or through a common hallway. Use the interactive table to examine housing units trends and change by county, metro and state. The following graphic illustrates use of the table to rank counties on the housing unit change from 2010 to 2014. The graphic shows that Wayne County, MI experienced the largest decrease among all counties. Click graphic for larger view with details. Follow my blog (click button in upper right column) where I will review related market topics, using other data resources and analytical tools available to you at no fee. Upcoming topics include an update on the Housing Price Index and the Rental Vacancy Rate access, interpretation and role as a leading economic indicator. .. the popularity of block group demographic data is mainly due to this being the smallest geographic area for which annually updated demographic data, with U.S. wall-to-wall coverage, are available from the American Community Survey (ACS) — or any other source. While block groups nest within census tracts from both a geometric and geocode hierarchy perspective, the relationship between block groups and ZIP code areas is far less clear. 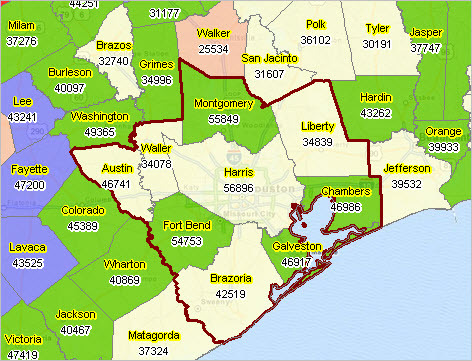 Analysts are often interested in relating block group geography and demographics with ZIP code areas. 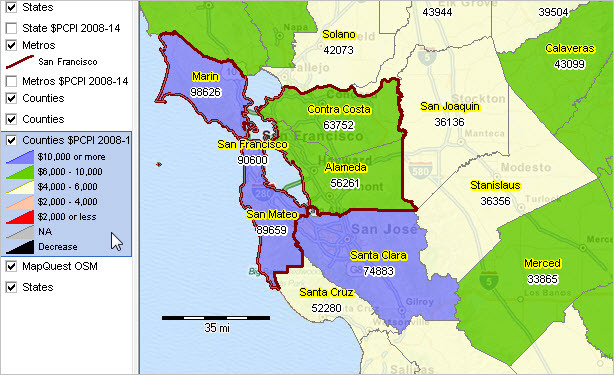 The Census 2010 217,740 block groups intersect with 32,824 ZIP code areas forming 308,805 BG-ZIP area combinations. This section reviews tools to examine the relationship between block group geography/demographics and ZIP code areas. See related Web section for full details. 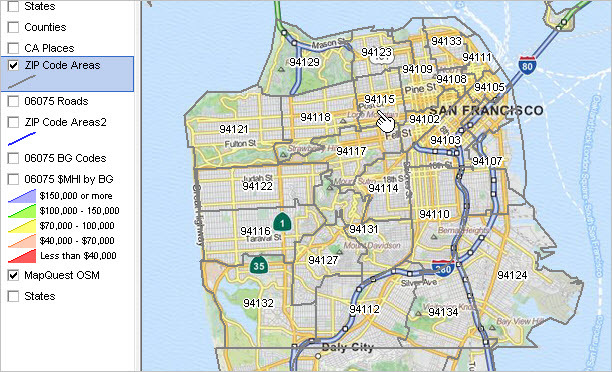 – view all San Francisco ZIP code areas; see ZIP 94115 in context. The cross-hatched BG 060750157001 (or 06-075-015700-1) is split by ZIP code 94115. What part of the BG is in ZIP code area 94115 and adjacent ZIP code area 94118? The situation is similar for BG 060750157002, directly below 060750157001, which is split into 3 ZIP code areas. Use the interactive table to make these determinations. The interactive table illustrated in the graphic below contains a row for block group area part which intersects with a unique ZIP code area. 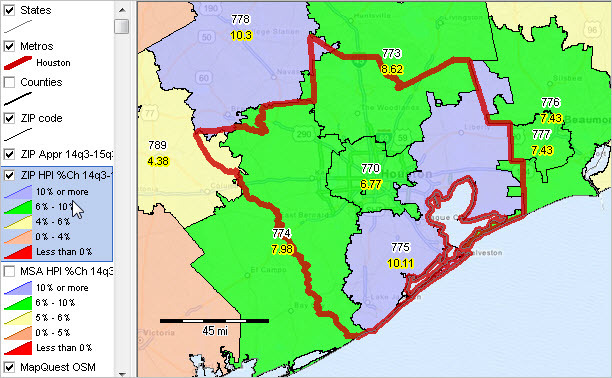 The simple case of a BG being split into two ZIP code areas can be visually observed as shown in the graphic presented above. A tabular relational table offers processing advantages compared to visual geospatial depictions. Here is an example. ZIP code area 94115 contains whole or parts of 32 BGs. To view/verify this using the table below, 1) click the ShowAll button below the table, then 2) click the Find ZIP button (edit box at right preloaded with this ZIP). The table refreshes with 32 rows — the BGs intersecting with this ZIP code area. Verify there are 32 BGs; the BG codes can be viewed in column 1. 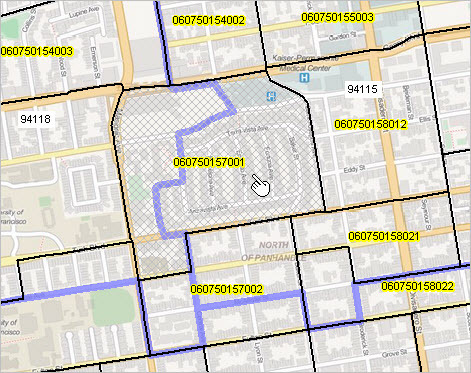 In the above map at the top of this section, block group 06-075-015700-1 is shown visually to be contained in two ZIP code areas. To view how block group 06-075-015700-1 is split among multiple ZIP code areas using the table below, 1) click the ShowAll button below the table, then 2) click the Find GEOID button (enter G0607501057001 in the edit box to right of Find GEOID then click Find button). The table refreshes with two BGs. In this example, it can be seen that the total BG population (Census 2010) is 1,375. The part of the BG population is shown and the percent of the population from that BG allocated to the corresponding ZIP code are shown. This BG has a total area 0.09 square miles. 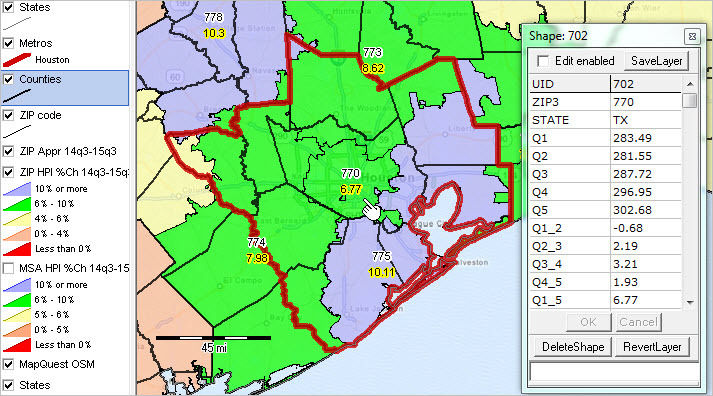 The part of the BG area Census 2010, square miles) is shown and the percent of the area from that BG allocated to the corresponding ZIP code are shown. .. or maybe it should be “enhancing the propensity for luck.” Luck often occurs when the environment is favorable to being lucky. Luck is a major factor underlying great things happening. Of course there is also bad luck. Luck comes in small and big bundles. One small piece of luck can change one’s fortunes, broadly defined, in permanent, enormous ways. This blog generally addresses topics on the role and use of tools and data to know about a situation or trends … or influence favorable outcomes. Luck can play a role to influence favorable outcomes. Today is a “Friday the 13th.” One of the few days that some are leery about, for no good reason. For me, I don’t think bad things will happen, but it’s on my mind. I might think about it once/twice in the week lead-up, or on that day. Does that create an environment for possibly less luck propensity? Maybe. While luck is a matter of being at the right place at the right time, it can also be a matter of how one creates expanded opportunities for being in the right place at the right time … and being able to read the situation. Maybe a luck-oriented opportunity requires 2-3 extra steps for it to present itself. Plus other things worthy of dwelling on. Enjoy your Friday the 13th. Go expand your opportunities for luck to occur; enjoy possible good fortunes. Consider how you can enhance luck propensities to achieve improved outcomes. It is not all strictly chance. .. several important U.S. by county demographic-economic data resources become available in the November-December time period .. review how these data mesh with your needs and mark your calendar. There are many reasons that national scope county-level data are important. The county geographic level is the most widely used statistical data summary level. 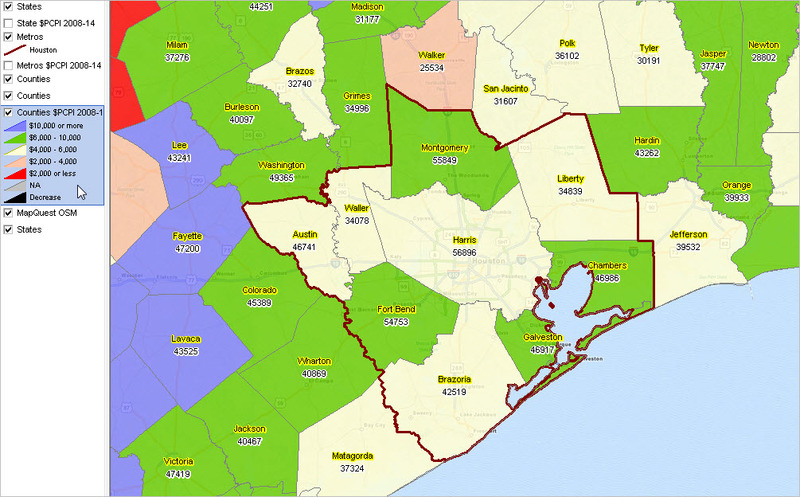 While many analyze ZIP code data, there is a narrow range of ZIP code summary data available compared to county level data. Counties offer a good geographic drill-down; data can be analyzed for sub-metro and sub-state areas. County geography changes very little over time; counties offer more geographic stability for long-term analysis than metros (above them) or census tracts (below them). More information .. set data release date reminder. More information … updated today with 2015Q1 interactive table. Set data release date reminder. There are other important metro and small area Federal statistical resources becoming available in this period. 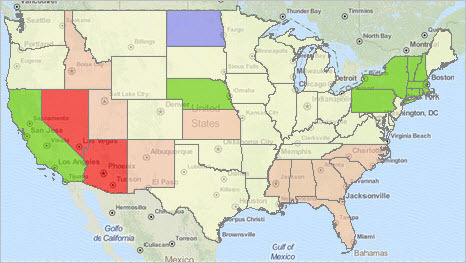 See related section Navigating the Federal Statistical System for a more in-depth resource.